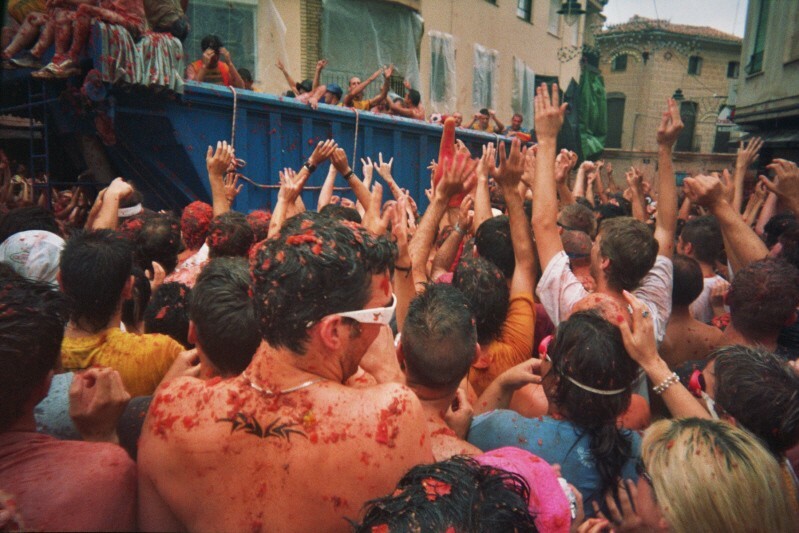 Most of the festivals around the world involve harmless fun and bonhomie, despite the huge crowds they draw. If you want to experience the blood splattered look of a war zone, or simply improve your target practice, you’ll feel right at home in Buñol in August. 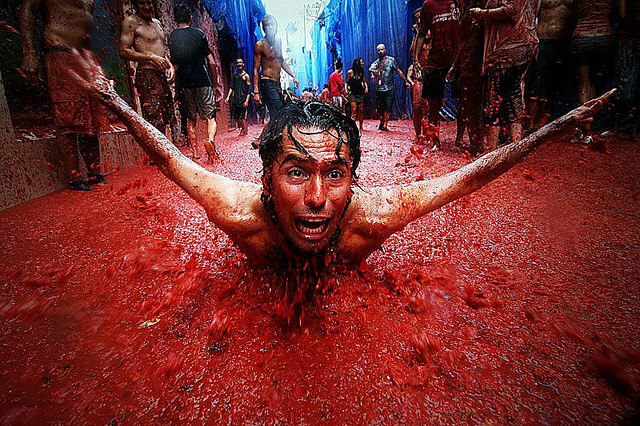 This town in Eastern Spain plays host to the sauciest and juiciest food festival in the world – La Tomatina – the tomato throwing festival. There are many stories about the origin. The generally accepted version is a market fight between groups of boys in the 1943-44, followed by a similar but planned fight the next year at the same spot. 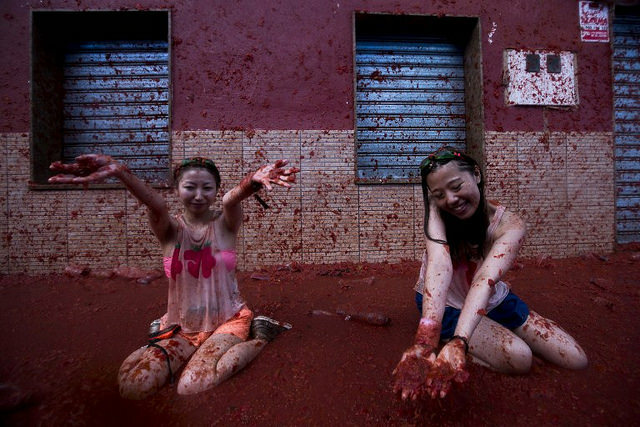 This became an entertaining activity for the people involved and soon evolved into a friendly, annual ritual. 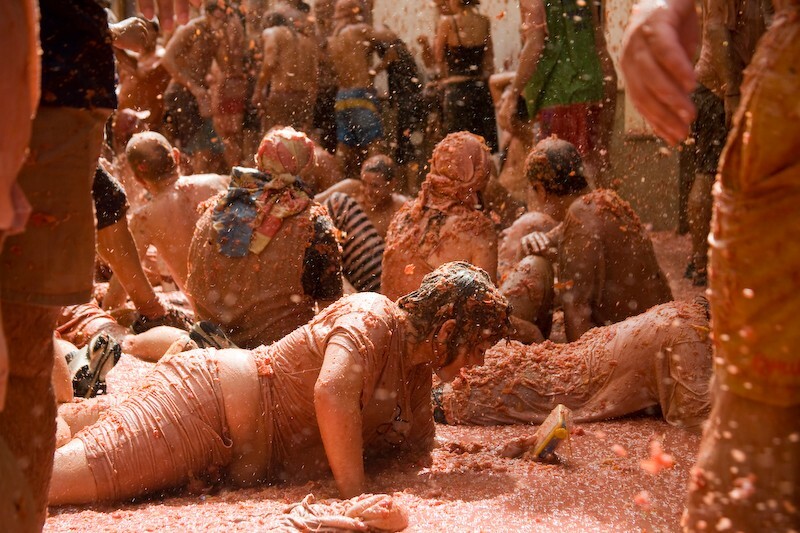 Organised as a festival for the first time in 1945, La Tomatina has had its share of detractors. It was banned in the 1970s by Francisco Franco for not having a religious origin. Held on the last Wednesday of August each year, the festival lasts for an hour between 11 a.m. to 1 p.m., but the celebration starts weeks ahead. The event attracts maximum visitors from Australia, US, UK and Japan. To ensure a clean and secure event, the town council (official organisers) made the festival a ticketed affair with an entry free from 2004. You can’t throw tomatoes around unless you wear the official wristbands or bracelets. 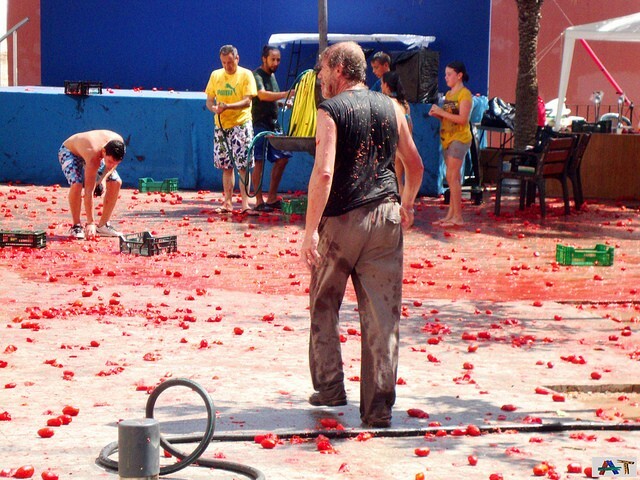 What goes on at La Tomatina venue? The festival officially starts when a person climbs a two-storey, slippery pole in the town square and manages to retrieve the ham strung on the top. The tomato laden trucks and lorries start rolling into the square soon after. The game begins with a rocket shot and ends with a warning shot. 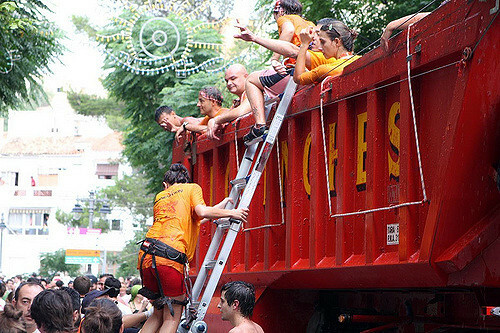 In the meantime, locals have their share of fun with revellers by drenching them with water from hose pipes, water pistols and water bombs. Are there restrictions and rules for the festival? Squeeze the tomatoes before throwing them at someone. This is done to prevent injuries. Other projectiles are banned at the venue for the same reason. Keep your shirt on at all times, but that doesn’t prevent some members to ripping them off in the excitement. Stop the fight and drop your tomatoes when the warning bell goes off (you can always carry them off as mementos). Make way for the tomato trucks and also avoid getting hit by one. You can enjoy a mock bullfighting scene or participate in the water and wine festival at Requeña the previous evening. 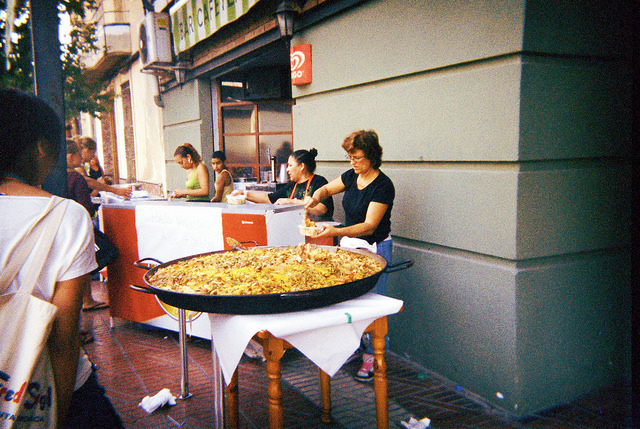 A Paella cooking contest takes place the previous night. How many tomatoes meet their pulpy, saucy fate? 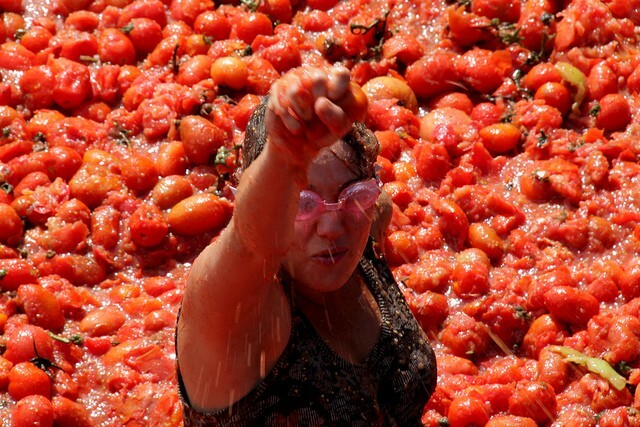 The event now involves around 90,000 pounds of tomatoes and over 30,000 celebrators. 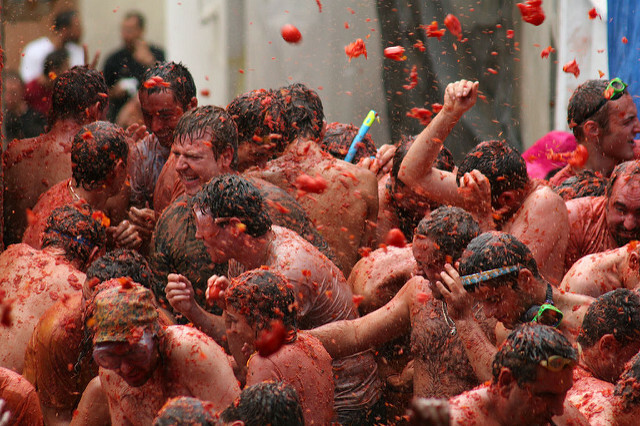 The tomatoes are specially cultivated for this festival at Extremadura in Southern Spain. The tomatoes thrown around are cheap, low quality, and not-fit-for-cooking types. 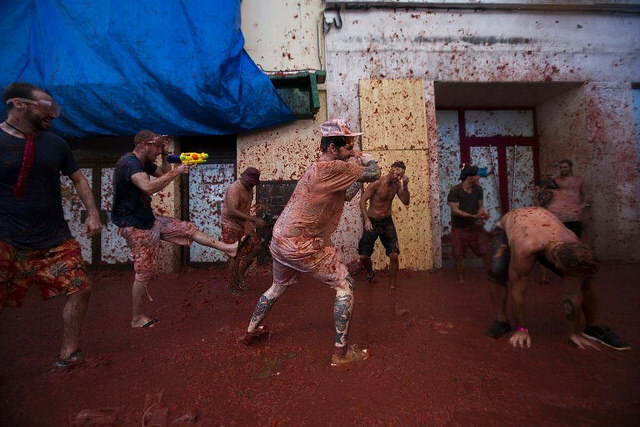 Participants either have water sprayed on them by locals or clean themselves up at public showers to remove the tomato bits and acid from their skin. The streets are hosed down with aqua ducts by the town’s fire department. 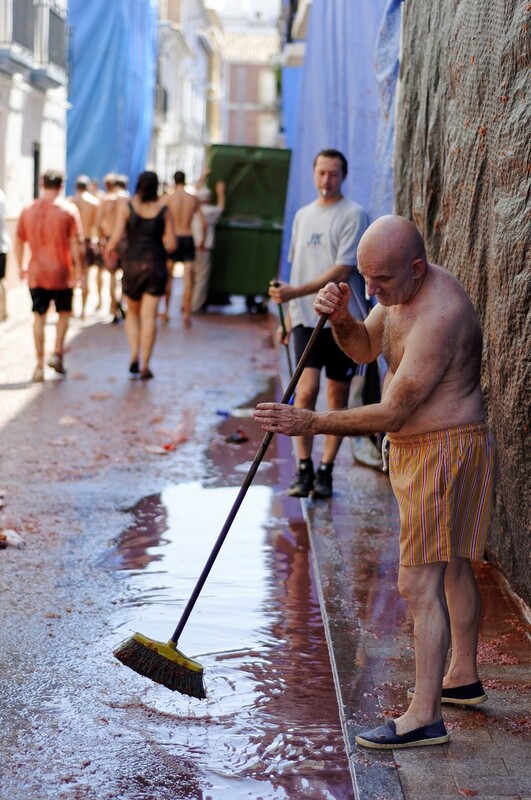 The acid content in tomatoes is said to give the cobblestone streets a cleaner and fresh look, post festival. 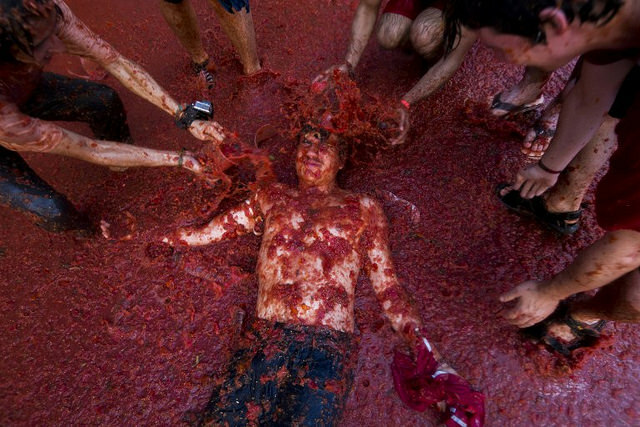 La Tomatina has inspired numerous spinoffs like the Sutamarchán Tomatina in Columbia or Reno Tomatina in Nevada, USA. Colarado and Texas have their own tomato wars at Twin Lakes town, as do the residents of San José de Trojas, Chile, and Dongguan, China. But not of these can quite match the phenomenal success or global popularity of the original. 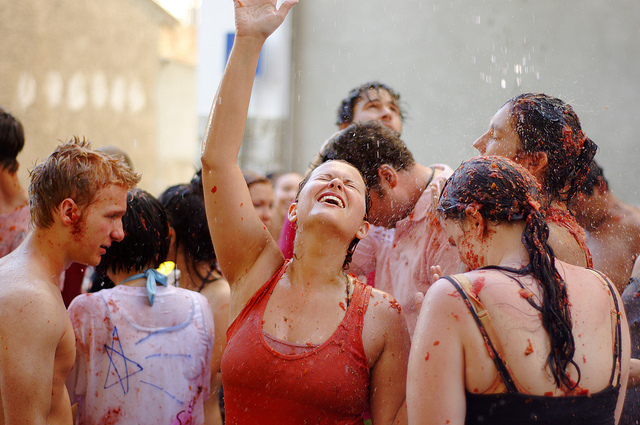 How have participated in the famous tomato throwing festival? Share your experiences with us!